10. Shaw University is a fictional college: Just like Baker is a fictional town. When I first wrote this series almost 11 years ago, I was going to use the college I attended, University of Houston, as the backdrop for the “crew,” but I decided to make everything fictional and thought up Shaw. I still consider UH the inspiration, though. 9. The Tunnel was an actual club in Houston: I remember going to The Tunnel during my college years, which was sort of a huge club back in the day. I used that as another inspiration for the crew to hang out at. 7. Some of the scenes from Love Always were taken from real life events: I revealed during a book discussion that some of the scenes in Love Always were taken from real life events. I found out I was pregnant during my last year of college and I did have those awkward moments going into class (especially trying to fit into one of those desks). Although I did not go into labor in class (I was actually about to start my last semester when I had my son), the labor and delivery scenes were REAL! And yes, my husband was too nervous to cut the umbilical cord, but that was to be expected. 6. Issac’ s character was based off of an ex: This goes back to the original story. If you read the original, you all know that Riana was with Issac before she met Shawn. Back in 2004, I couldn’t find anyone that could fit the description of Isaac, especially being someone that was a jerk, so I thought of my ex. I continued to use him in the current series as well. By the way, both scenarios from the original and current versions were strictly fiction. 5. My mom was the inspiration for Melanie: When I wrote the scenes between Riana and Melanie, I thought about the talks I had with my mom and the bond that she and I had when I was growing up. Those scenes were a little hard to write because during the time I wrote Love Unbroken in 2011, my mom passed away from breast cancer. There were times when I didn’t even think I was going to continue, but I did, and I’m proud of the finished outcome. 4. The Way We Were was supposed to been the final book in the series: There were only going to be four books in the LLH series, but when I done a poll on my blog about which book readers wanted to read next, an overwhelming response wanted Love Unbroken part 2.I decided to change the name to Love Always and it showed not only Riana and Shawn maturing into young adults, but it changed everyone in the entire series. 3. 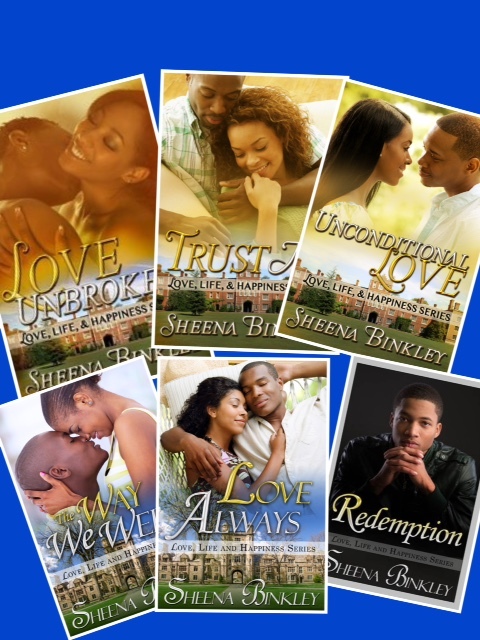 The poems written in Love Unbroken were actually real: One of the things readers loved about Love Unbroken were the poems; those poems were actual poems that my husband wrote to me when we first started dating. At first, I wasn’t going to share them, but since the book was sort of inspired by my relationship with my husband, I decided to (with his permission, of course). 2. The Walkers: Since my husband is the inspiration for Shawn, that probably had some of you wondering who is the inspiration for Marcus. Now, my husband does have a brother, who is four years older than him, but he is not Marcus. In fact, there’s a little of my husband in Marcus as well (of course not the womanizer part). Besides Shawn and Issac, the other male characters are not modeled by anyone I know; they are just characters that I created. So, since my husband is Shawn, does that make me Riana? Maybe so. 🙂 And no, I can’t sing. I was in my elementary school choir, but that doesn’t count, lol. Bonus Tidbit: Redemption was a random story: I was going to end the series once I was finished with Love Always, but after having a great conversation with a reader, the concept of Nathan having his own story was brought up. She picked up throughout the series how Nathan’s personality was and felt there was something more with his story and the things he has done to Riana. She felt that Nathan should have his own story so he could tell his side to everything that has occurred with Ri, Shawn, and with his parents; and that was how Redemption was born. When is Love and War coming?